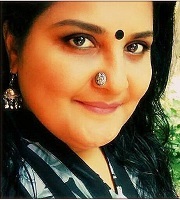 Jyotsna P Katayaprath, a creative writer and a translator, writing both in English and Malayalam, was born on 15 May, 1972, in Calicut, Kerala, to sree V P Nambiar and Smt. Katayaprath Parukutty. She has many published articles in print and e-magazines to her credit. Her first collection of poetry, Ashes of Yester Years: Revelations of an Indian Woman was published by Penguin random house, Partridge publishing in the year 2014. She has also dealt with a column namely Literary Beat in the journal Kerala Calling, a publication from IPRD, Govt of Kerala. Mrs. Jyotsna was also a member of the state's text book material preparation committee for the higher secondary English course book. Two of her translations, the biographies of the legends O V Vijayan and Vaikom Muhammed Basheer were released at the Sharjah book fest ’18. With panache for passionate and confessional writing, innovative teaching and psychological counseling for teenagers, Ms Jyotsna P Katayaprath has been a successful English Language Teacher for more than a decade and a half. Ever since her post-graduation and M.Phil, in English language and literature, and Masters in Education, she has been an effusive participant in literary festivals and creative writing workshops. As a writer, she has tried to make it clear how flexible and striking the woman in her is. She has maintained an eye for the off-beat, and dictates her heart in I’m Not Just a Body: Revelations of an Indian WomanII. For her, the world around her has been her laboratory–a storehouse of ideas.